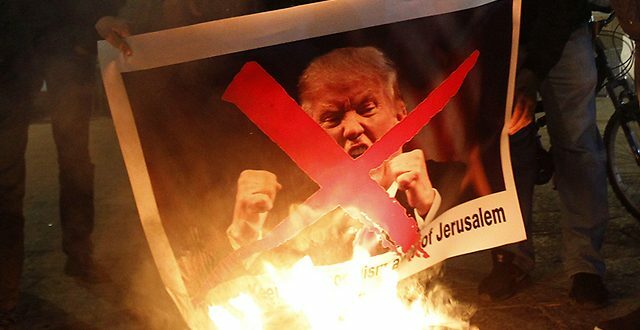 Donald Trump will declare formal recognition of Jerusalem as the capital of Israel on Wednesday,December 6, the White House has said, breaking with years of precedent and potentially leading to unpredictable consequences for the Middle East. The region is braced for the prospect of unrest in anticipation of the declaration, due at 1pm in Washington, and US embassies around the world have been advised by the state department to bolster their security. US government employees have been told to avoid Jerusalem’s Old City and the West Bank until further notice. In his remarks to be delivered in a diplomatic reception room in the White House, Trump will base his decision on ancient history and current political realities that the Israeli legislature and many government offices are in Jerusalem. He will also order the state department to start the process of planning and building a new US embassy in Jerusalem, but White House officials said that process would take at least three years. Note EU-Digest: This might be pleasing news to his base, but it certainly is not the right moment to do so, specially since the US could have used this as a major bargaining chip when dealing with other Middle Eastern States. Historically Jerusalem can be called the capital of Israel. During its long history, Jerusalem has been attacked 52 times, captured and recaptured 44 times, besieged 23 times, and destroyed twice. The oldest part of the city was settled in the 4th millennium BCE, making Jerusalem one of the oldest cities in the world. For example, the Jewish periods of the city's history are important to Israeli nationalists, whose discourse states that modern Jews descend from the Israelites and Maccabees, while the Islamic periods of the city's history are important to Palestinian nationalists, whose discourse suggests that modern Palestinians descend from all the different peoples who have lived in the region. As a result, both sides claim the history of the city has been politicized by the other in order to strengthen their relative claims to the city, and that this is borne out by the different focuses the different writers place on the various events and eras in the city's history.